It's a well-worn feel-good movie trope, but the reality is sometimes all it takes to fix a blatant injustice in the world is to force adults to see things from a kid's perspective. And sure enough, that's exactly the tactic one intrepid 9-year-old in Colorado employed this week when he took to the podium at a town board meeting and pushed for the leaders to overturn its century-old ban on snowball fights. You better believe it worked, because the board voted unanimously to strike the rule down. 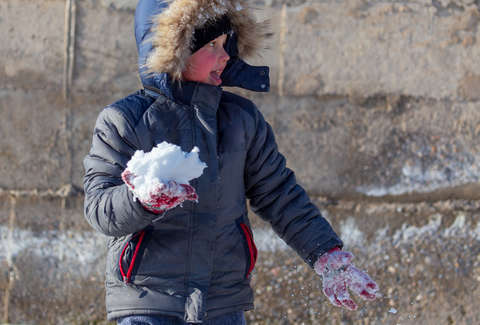 During a town board meeting in Severance, Colorado on Monday night, 9-year-old Dane Best presented a list of reasons why it should overturn an ordinance outlawing snowball fights, which has been on the books for nearly a 100 years. He'd apparently been obsessing over the law in recent weeks after learning about it during an elementary school field trip to City Hall in early November, according to The Greeley Tribune. Best wanted to make sure he could have a proper snowball fight this winter without breaking the law, and even wrote letters with his classmates to push to get rid of the ban. His arguments were evidently convincing, because the board voted unanimously to lift the ban on snowball fights, which fall under an umbrella ordinance against "throwing or shooting stones or missiles at people, animals, buildings, trees, any other public or private property or vehicles" that has existed since the town was founded. “All of the kids always get blown away that it’s illegal to have snowball fights in Severance,” said Kyle Rietkerk, assistant to the Severance town administrator. “So, what ends up happening is they always encourage the kids with, ‘You have the power you can change the law.’ No one has.” Well, no one, until Dane Best. Though the snowball fight ban has never really been enforced, this will be the first year it will be technically legal for residents to wallop each other with frozen projectiles. When the board asked him who he plans to target with his first legal throw, the kid didn't hesitate, and pointed straight as 4-year-old brother. All that to say, he may have a preternatural understanding of local government, but he's still a 9-year-old at heart.